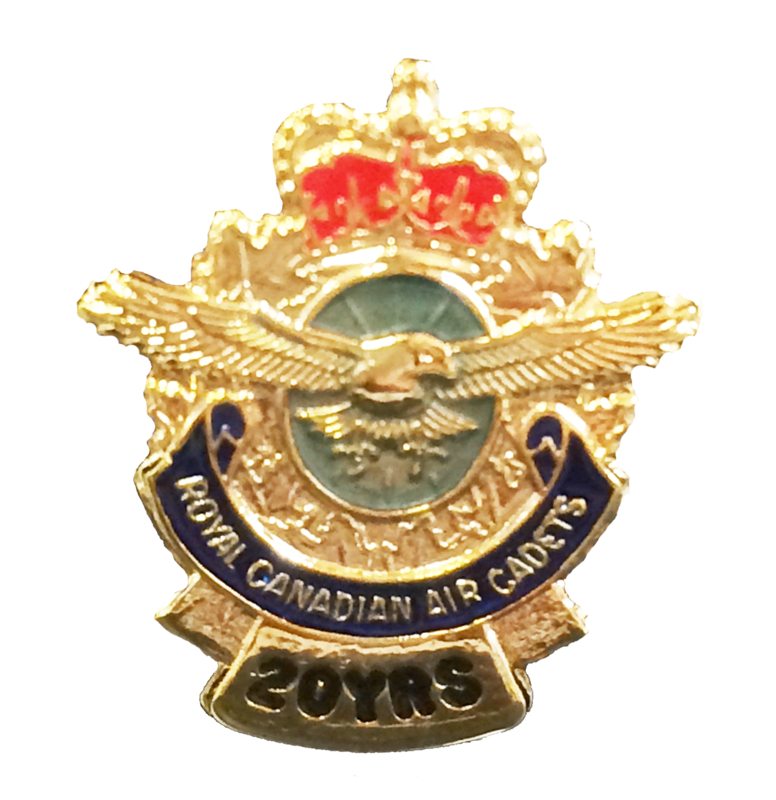 Air Cadet League members with ten years’ service to the League (either at the SCC or Provincial level, or a combination of both), can apply to receive their League Volunteer Service Medal. There is no charge for the Medal and the Office will arrange for (once approved) a League representative to attend the Squadron for presentation locally, or at the OPC Annual Conference for presentation. The first presentation for SSC members took place in February 2010 at 631 (Sentinel) Squadron in Scarborough, to Sandra Lackan, Roy Lunau, and Evelyn Walsh. OPC Service Pins are available in 5 year increments, for any service in the Air Cadet Program. The most prestigious award presented by the OPC. It may be awarded annually to one individual to recognize particularly outstanding service and dedication; often, but not always, for an extended period of time. The recipient will be an individual involved in or connected with the Air Cadet Program who has demonstrated an effective and selfless commitment to the OPC and/or Air Cadets in Central Region generally. Nominations are accepted from any two members of the OPC community. For the guidance of proposers: please note that this award is intended to recognize service at the Provincial or Regional level, not normally at the Squadron level. A prestigious award, for any member at the Provincial, Regional or Squadron level ‐ who has distinguished him or herself by exceptional ongoing performance, or through an individual act or project. Up to six Certificates may be presented annually to League members; as well as an additional, limited number for DND partners or affiliated individuals / organizations. Nominations are accepted from any two members of the OPC community. Certificates of Merit may be presented to League members at the Provincial, Regional or Squadron Level, DND partners (CIC / CI / CV), or other individuals or organizations, for work well done over an extended period of time, or for a specific accomplishment in support of the OPC, a Squadron, a specific activity, or the Air Cadet Program generally. Up to 20 Certificates (10 to League members and 10 to DND partners / other stakeholders) will be considered annually. Nominations are accepted from any two members of the OPC community. Since 2007, the OPC has recommended its quota of six members at the provincial level. We have now learned that we can also sponsor the nomination of up to six members at each of our “chapters” / Squadron Sponsoring Committees. Civilian Volunteers are eligible; however, CIC Officers and Civilian Instructors do not meet the Ministry criteria. Services performed during the normal course of professional or business duties are not eligible for recognition. The OPC annually recognizes up to six outstanding CIC Officers holding the rank of Major or Captain and up to six exceptional ‘junior’ CIC Officers (i.e., those holding the rank of Lieutenant, 2nd Lieuten‐ ant, or Officer Cadet). The awards are to recognize exemplary service and/or exceptional achieve‐ ment in Regional, Area, CTC or Squadron venue. Most often, the CIC Officers Award also takes length of service and command responsibility into account, while those for Junior Officers, of neces‐ sity, focus on performance in staff or operational roles. Any member of the OPC community may initiate a nomination; however, it must be endorsed by the appropriate Area Training Officer or RCSU(C) Headquarters, who will forward nominations to the Honours & Awards Committee. The OPC annually recognizes one outstanding CIC Officer and one outstanding Junior CIC Officer, who are employed in the Cadet Flying Program. Any member of the OPC community may initiate a nomination; however, they normally originate from OPC members or DND partners actively involved in the Flying Program. All nominations must be reviewed by the appropriate Cadet Flying Site Com‐ mander and the Regional Cadet Air Operations Officer.